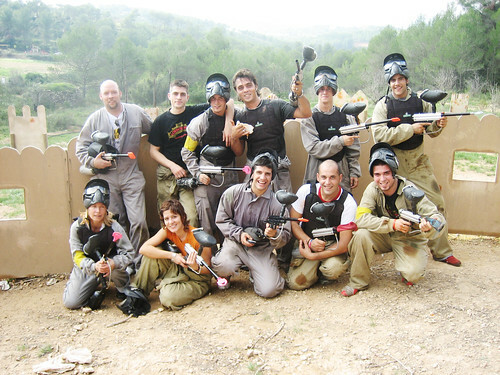 A team may apply various defensive strategies during the course of a paintball game. When it comes to the game of paintball, members of the team must be oriented with good defensive tactics to protect themselves from being hit as well as protecting their flags from the opponent’s aggressive attacks. Although there could be some instances when the team is more cautious in protecting their flag and becomes more tentative to attacking aggressively may become a problem if the other team advances nearer to the base. A good defensive stand may just be enough to save them from losing the game. Here are some strategic defense systems that a team may apply to win a paintball game. It is important for a person to cover himself safely from attackers firing paintballs from every direction. It is important that a person be good in concealing himself from possible close range attackers. Look for concealment first, before finding a safe place where a person can hide. The best attack to execute is by catching the opponent by surprise. The attacker may think that he is firing on anything that he thinks would be a threat to his possible elimination. As a team, the leader should assign each member a different position. They must not be grouped in the same position as that cause multiple elimination since the members could be attacked in a single round of fire without any effort from the opponents: that would be an easy way for them to win the game. He must exert an effort to act as a back up for his other teammates. They must be within sight all the times so that they may ask for a counter attack if they are surprised with a firefight. He should know how to control his firepower. Concentrate on a specific target so that no effort is wasted. It is not advisable to be firing at a sure target unless a teammate asks for a cover from his launches. When it comes to this sport, a good offensive attack is supported by a strong defensive tactic. When a person aims and hits a target, it actually means that he is playing with good defense because he is aware of the positioning and movements of his opponents. When he hits and eliminates a target that will advance him to the next flank for more possible targets. This is one good method for the team to win the game with a good defense system and a strategic offensive attack. Playing paintball requires vigorous physical activities: running, jumping, crawling, etc. Eating right, brisk walking, running and eliminating vices such as drinking, smoking, and drugs should be attained to get into shape. Be well informed: books, magazines, and online information are always available for players who want to play or master the game. More of the skills must be learned during the actual playing of the game; but tips and suggestions are important too. Visual practice. Assess the environment where the game will be played. Paintball is a real world scenario for the player. It may sound silly but try developing your instincts in a supermarket. Visualize the routes of escape, where the other shoppers are and what your next step will be. Prepare all of the equipment and accessories that are needed prior to the game. Pack the batteries, towels, pads, etc. and save time looking for an item once the game has started. Wear comfortable clothing that is appropriate for the paintball game. Look for comfortable camouflaged items that are loose so that movements are easily made. Do not wear clothes that make sounds when moving as this will lead the other shooters to you. Before the game, if there is time use it to get the feel of the field. By doing this a player can visualize the field itself, especially during daytime. Look for hiding places and the places where you anticipate the opponents might go. Attitude plays an important role in playing the game. Know your role in the paintball game so you can derive strategies not only for yourself but for the whole team. Be flexible by changing tactics in every game. Opponents can see the pattern of a player and can be use it against him if he does the same thing every time. Review past mistakes and try not to make them again. The best tips that a player can get are from his last game. Upgrade the gadgets: some accessories have inexpensive ways to upgrade. It not only increases your efficiency but also your confidence. Mastering the game of paintball will take some time. Be patient, practice and time is more important than expensive equipment. Playing paintball is habit forming. The best offense is having a good defense. This kind of thinking is usually deployed in sports such as basketball or soccer where the team does its best to prevent the other team from scoring especially in a championship match. A team can also use the same tactics in the game of paintball by preventing the opposing force from capturing the flag. Games start with both sides having limited ammunition. Since the game can last for a very long time, the team should make every shot count. The players should only fire when there is a clear shot rather than not being able to fire when it matters the most. Spreading out over a certain area is a good defensive tactic. This is to cover the enemy no matter which direction he may come from. Should the opposing team see one of your team members, the others who have a better view should neutralize the opponent. If in the opening minutes of the game, the team has lost half of its members, the best strategy is to fall back to the base and regroup. A perimeter should be set up to prevent the other team from outflanking the group while patrols can be sent out to search for the enemy. If a scout has spotted the enemy, the person can take the opponent out. Should there be a group moving towards the base, then go back and tell the others and fight off the enemy with the same number of people. This plan could fail if any of the members of the opposing force escapes the attack and informs the others the location of your base. The trick in catching the enemy off guard takes camouflage and concealment. Since the guns have a limited range, it is best to wait until the opposing force enters the “kill zone” before any shooting takes place. When a firefight takes place, the player’s position has been revealed. Since the enemy will return fire, the person can still survive the enemy’s bullets by getting sufficient cover. If this is not feasible, then transferring to a better area is a good idea. The player should inform the others before moving so that the others can give adequate cover. It takes planning for the play to work. By communicating on the field, the team has a good chance of defending the base then surging forward to kill the enemy or capture the flag. Paintball teams use the online paintball game much like other sports teams use game footage. Recording every paintball game, especially from multiple viewpoints, allows a paintball team to review their performance. Intelligence about opposing paintball teams can be gathered as well. When these recorded paintball games are put online, the team can review them together. Individual players can then replay them later to emphasize certain points. One of the best uses for online paintball games is to teach new players strategy and tactics. New paint ball players can observe recorded online games to view openings deployment moves, mid-game crossfires, and how winning moves were performed. The online paintball recordings can be stopped and reversed as many times as possible to make a point. Experienced paintball players use recorded online games to critique the performance of themselves and their team. They can gauge the effectiveness of maneuvers practiced before the paintball tournament. Paintball players can see who was out of position, and how to correct the mistake next time. Players who are often struck by paintballs can see what bad habits they have, and take evasive action. Remember that a recorded paintball match includes both teams. Each team can review the online games to determine their opponents’ strengths and weaknesses. Knowing how the opponent deploys their paintball sniper can be a big advantage. Teams employing misdirection or other confusing tactics can be countered with diligent online game reviews. Perhaps a team will even be able to spot the missing paintball opponent that they could not see during the game. Reviewing paintball games online can reveal a wealth of information to novice and experience players alike. New paintball tactics can be learned. Opponents’ strategies can be revealed and countered. Snipers can be neutralized. Take full advantage of the online paintball game to make your team the best it can be.